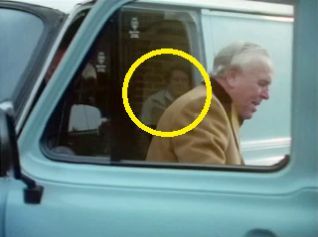 Minor blooper spotted in this one as Arthur, Ray & Ron all return to the lockup. Hello hello, who's this hanging about in the reflecton? Gave this a watch last night and could not remember anything about it from first time around. Not a bad little episode, some lovely dialogue throughout this episode, I particularly liked the scene where Arthur speaks to Ron at his health food van and as soon as we hear about Ron's past life and what Arthur had planned it was only going to end in trouble. Some other good moments when Arthur was left alone with the dog at the lock up and then the drunk who appeared, and the bit near the end when questioned by Morley about Ron and Rays predicament, was classic Arthur. I struggled to place Simon Rouse initially, best known for playing Jack Meadows in The Bill. It must have been the hair which confused me. A great few lines in this one: "Is this your car?" "Capitalist pig!" "God I hate capitalists. I'll drink your drink mind you, just don't expect me to like you!" Lots of laugh out moments.Like the scene where Arthur finally figures out how to open a bottle of tonic water without a bottle opener.He also finds a standee of Rolf Harris and asks "Whatever happened to him?! "If only you knew Arthur,if only you knew. Wasn’t there another blooper where the Kenneth Colley character looks directly into the camera after he installs the alarm system. This is around 10 minutes 40 seconds into the programme. 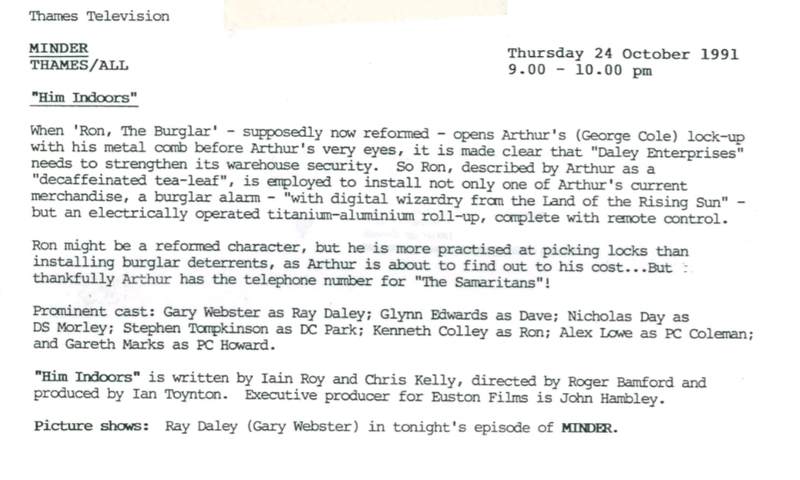 I don’t know if it was deliberate unprofessionalism, but unless there is a scripted breaking of the fourth wall (unlikely as Ron the burglar is only a guest character). Weird scene.